DETROIT, MI - Corvette Racing will have a high profile on the town and on the track when motor racing returns to the Motor City for this weekend's Detroit Belle Isle Grand Prix. Chevrolet and its factory road racing team will take center stage in Saturday's inaugural American Le Mans Series Detroit Sports Car Challenge on the revamped street course near GM global headquarters. Corvette Racing's roots run deep in metropolitan Detroit. The team is managed by GM Racing from offices in the Renaissance Center, and Compuware, the team's primary sponsor, is based just a few blocks away in downtown Detroit. The race shop is in suburban New Hudson, and the powerful LS7.R small-block V-8 racing engines are built and tested in nearby Clinton Township. "Along with the 24 Hours of Le Mans, the Detroit Belle Isle Grand Prix is one of the highlights of Corvette Racing's season," said Corvette Racing program manager Doug Fehan. "It's huge for the team to race in Chevrolet's backyard, and competing on a new circuit we've never seen before is exactly the kind of challenge that our engineers and drivers thrive on." Chevrolet's presence at the Detroit Belle Isle Grand Prix will be unmistakable. Corvette is the Official Vehicle of the event, and a 2007 Corvette Z06 will pace the ALMS race on Saturday and lead a parade lap prior to the IndyCar race on Sunday. There will be a Corvette Corral on site during the race weekend, and Chevy will have a large display in the Meijer Family Fun Zone. Known around the world for setting fast times on race tracks, the Corvette Racing team will be running flat out to build momentum for the 10th round of the ALMS series. 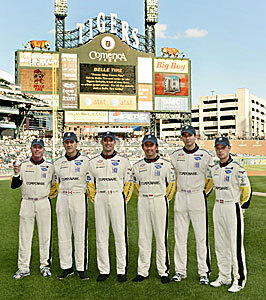 All six team drivers - Oliver Gavin, Olivier Beretta, Max Papis, Johnny O'Connell, Jan Magnussen and Ron Fellows - will be on hand for a full week of activities that includes throwing the ceremonial first pitch at the Detroit Tigers baseball game on Monday night, a Corvette Pep Rally at the GM Plaza on the River Walk on Tuesday, a media dinner, charity events and autograph sessions with hundreds of Corvette club members. "We're looking forward to being the home team for the first ALMS race in Detroit," said Gavin, who shares the lead for the GT1 drivers championship with his teammate Beretta in the No. 4 Compuware Corvette C6.R. "It's going to be great to race so close to GM headquarters. It will be a very busy week, but I see that as an opportunity to say thank you to the people behind the scenes who make Corvette Racing successful." "I've heard good reports about the Belle Isle circuit and on paper it looks like it's going to be a good venue for racing," Gavin continued. "There are several good straights on the track, so we'll have to make sure that we get good traction coming off the corners that lead into the fast sections. It might be similar to Long Beach in that respect, so that may be the setup we start with. My engineer, Steve Cole, has been working on gear ratios and chassis setups, so I'm confident that we'll be fully prepared." Johnny O'Connell drew the assignment to throw the first pitch at Comerica Park for Monday night's Detroit Tigers baseball game with the New York Yankees. The other five Corvette Racing drivers will be on the field to cheer him on - or to heckle the redhead from Flowery Branch, Ga.
"Racing in Detroit is a really neat deal for us," said O'Connell. "The people at GM know about Corvette Racing's accomplishments in the American Le Mans Series and in the 24 Hours of Le Mans, but this is our first opportunity to let them see firsthand what we do at the track. We'll be able to show them the incredible technology of the race cars and the fantastic reception that Corvette Racing gets from Corvette owners and race fans at every event. We're going to have everything shined and polished, and I can't wait to show our stuff in Detroit." Magnussen, O'Connell's teammate, has the advantage of previous experience on the 2-mile, 14-turn Belle Isle temporary circuit. 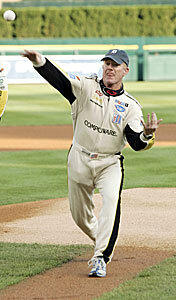 He raced there in 1999 in an open-wheel CART car. "I remember it's a good street circuit - narrow in a few places and bumpy in others, but I understand the track has been improved since then," said the Dane. "When I drove there in 1999, it was my first race with Patrick Racing, and it was a difficult track to get to know the car. Driving a Corvette C6.R on Belle Isle is going to be a completely different experience, but I'm sure that after I do a lap or two, it will come back to me. I was trying hard to stay off the wall, and I'm going to try to do that the next time as well." The Detroit Sports Car Challenge presented by Bosch, the 10th round of the 12-race ALMS series, will start at 3:15 p.m. EDT on Saturday, Sept. 1. The two-hour, 45-minute race will be televised live on SPEED Channel.